The oldest of the great painters of the Spanish Baroque, Jusepe de Ribera almost doesn't even qualify as a Spanish artist, given that he spent the majority of his life and his entire career in Italy. 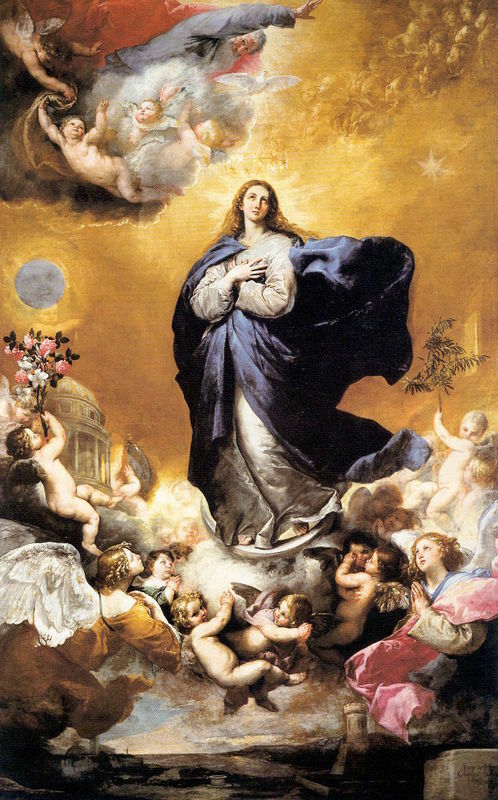 Nonetheless, the artist was fiercely proud of his Spanish roots, and furthermore lived in Naples, which during the 17th century was a Spanish territory. 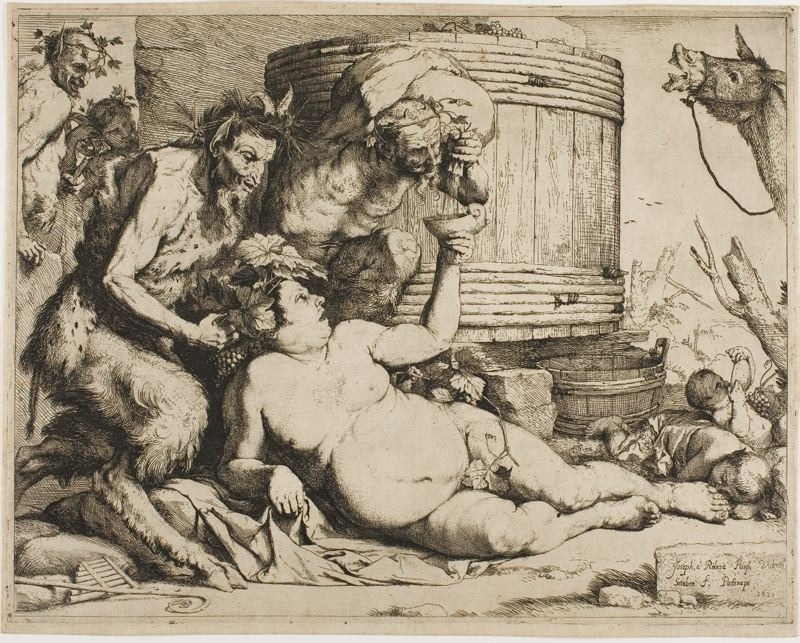 The artist thus had strong connections with his homeland and exerted an enormous influence on Baroque art, both in Spain as well as in the rest of Europe. 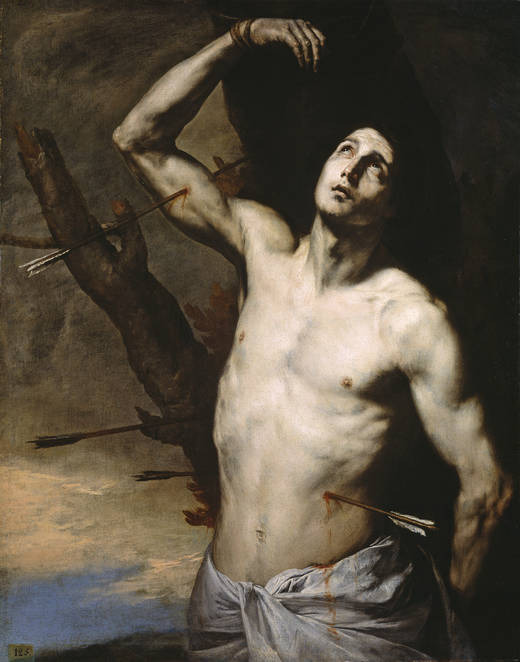 Ribera was lucky to be working in Naples. After becoming part of the Spanish empire in 1501 (the city would remain under Spanish rule for two centuries), the city's population tripled in size, making it Europe's second largest urban center after Paris. During the 17th century, Naples was a hotbed of intellectual and artistic activity, home to the century's greatest artists, philosophers, writers and musicians, at least until the great plague of 1565 wiped out half the city's population. By living and working in Naples, Ribera was guaranteed to be surrounded by cutting-edge art and wealthy patrons. 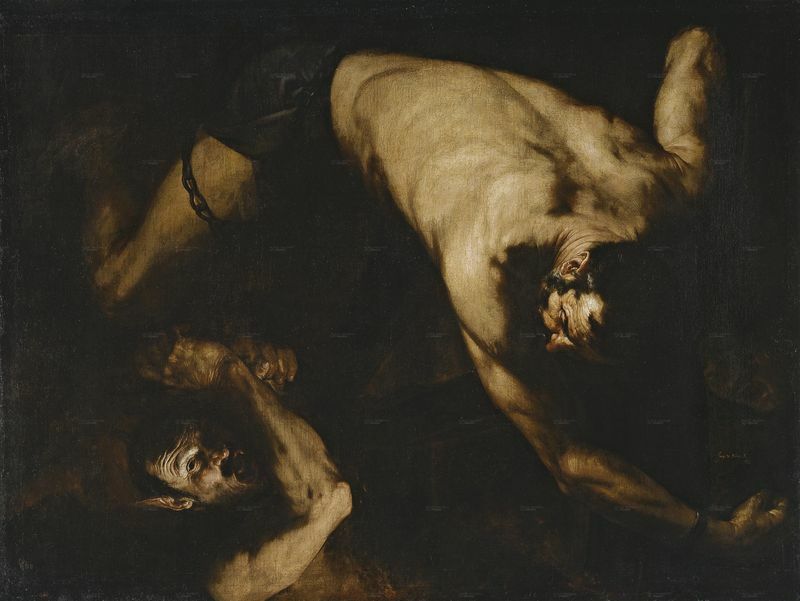 Virtually no documents exist that could shed some light on Ribera's childhood in Spain. It is known that he was born and baptized in the town of Játiva in the Valencia region, the second son of a successful shoemaker named Simón Ribera; he lost his mother when he was only about five or six years old. 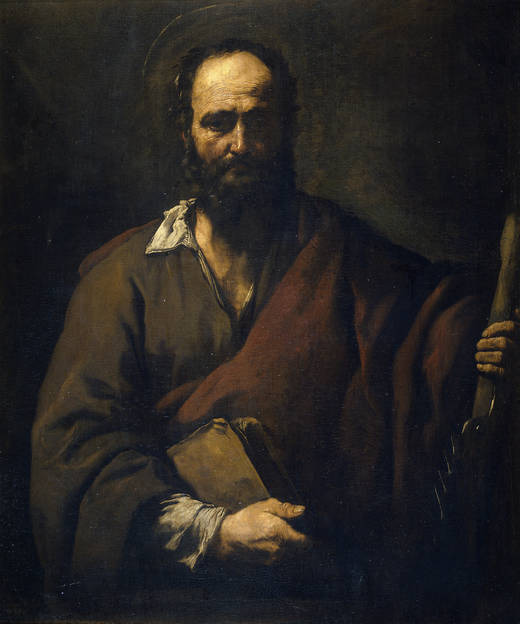 Although sons were usually trained to continue the same profession as their fathers, some art historians have speculated that Ribera's artistic pursuits could have been encouraged by other artists in his family. His paternal grandmother was named Juana Navarro of Tervel, and several painters with the surname Navarro were known in Valencia; this remains mere speculation, however. Ribera's biographer claims that as a boy, Ribera was apprenticed to the successful local artist Francisco Ribalta, although there is absolutely no evidence to support this claim. Whatever the facts of his childhood, Ribera was evidently displeased with the way things were going and left his hometown in pursuit of bigger and better things (popular belief holds that he left Spain over an argument with Ribalta concerning the master artist's daughter). Ribera was in Italy by 1611, stopping first in Parma, where documents reveal he executed a painting for the church of St. Prospero, and then ending up in Rome by 1613. Ribera stayed in Rome until 1616, studying at the Academy of St. Luke and living with his younger brother, Juan, as well as a whole flock of other fellow Spaniards in the house of a Flemish merchant on the Via Margutta. Contemporary sources suggest that during these early years in Rome, Ribera led a libertine existence, perhaps in imitation of Caravaggio, whose art Ribera so admired. He thus quickly ran out of money and, apparently to escape his creditors, fled to the Spanish-ruled Kingdom of Naples in 1616, where he would stay for the rest of his life. Fortunately for Ribera, as a Spaniard he was able to ally himself with the Spanish elite as well as the Flemish merchants who were in the upper echelons of Neapolitan society, and who were thus the primary patrons of art in Naples. Soon after his arrival Ribera made an advantageous marriage to Catalina Azzolino India, the daughter of the established and successful painter and art dealer, Giovanni Bernardino Azzolino (the haste of the marriage suggests that Ribera may in fact have arranged it before he even left Rome). 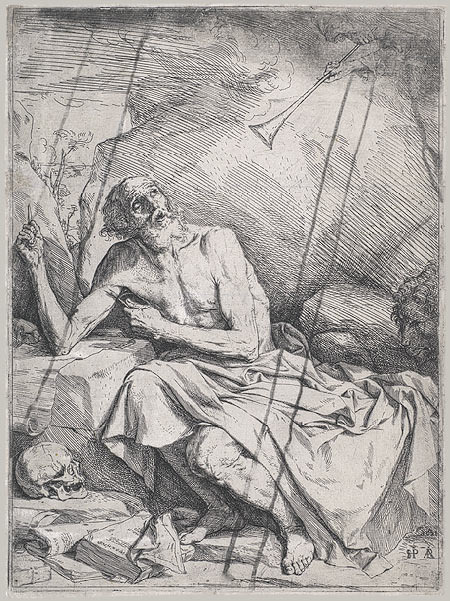 It should be noted that as popular as Ribera was as an artist, as a man he was often reviled. The Italian Neapolitans often resented their Spanish oppressors and Ribera's proud demeanor and apparently tempestuous personality were far from ingratiating. Contemporary documents reveal that Ribera took a long time to learn Italian, and never learned it well, speaking with a heavy Spanish accent and making atrocious mistakes in spelling and grammar in his correspondence, yet another slap in the face to his Italian rivals. After arriving in Naples, seemingly nothing could stop Ribera. 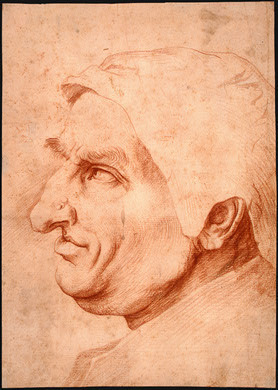 His reputation skyrocketed to the point that by 1618, Ribera was considered the most popular painter in town, garnering commissions from such elite patrons as Cosimo II de Medici, the grand duke of Tuscany, and the Viceroy of Naples. Overwhelmed with work, Ribera earned enough money to move into a larger house with a garden, just in time for the birth of his first three children in the late 1620s (son Anotonio Simone was born in January of 1627, followed by his little brother Jacinto Tomás in November, 1628, and finally little sister Margarita in April 1630). The 1630s proved to be even kinder to Ribera than the previous decade. In 1630 he received visits from Velázquez as well as the Spanish ambassador, who would later become the Viceroy of Naples and who commissioned several important works from the expatriate painter. In 1631, Ribera received the immense honor of becoming a knight of the Papal Order of the Vatican, one of the highest achievements any painter in Italy could hope for. Ribera's success continued throughout the 1630s to the point that by the 1640s, he was able to move himself and his family into a veritable palace (decadent digs complete with two gardens and an orchard) in the luxurious Chiaia district, near the church of St. Teresa degli Scalzi. By this time, Ribera had established a large, well-organized workshop to help him complete his plethora of commissions, which were far too numerous for one man to finish alone. In 1641, Ribera was lucky enough to be awarded the commission for the most important religious site in all of Naples, the chapel of St. Gennaro in the Naples Cathedral. Finally, as the icing on the cake, Ribera's prestige and social status would attain new heights when his daughter Margarita married a judge of the Tribunale della Vicaría named Giovanni Leonardo Sersale. Unfortunately for Ribera, what goes up must come down. The good times came to an end in the mid-1640s, when the artist fell seriously ill and his painting production came to a standstill. Just after Ribera finally recovered his health, the popular uprising against Spanish rule led by Tommasso Aniello Masaniello in July of 1647 forced Ribera and his family to take refuge in the Spanish Palazzo Reale, where Ribera would meet Philip IV's illegitimate son Don Juan of Austria. The uprising had major ramifications for Ribera: due to the repressive measures the Spaniards took against the revolting Italians, the artist and his family became completely ostracized by the city's Italian population. After the rebellion, the woes kept on accumulating just as fast as the accolades had a mere decade earlier. 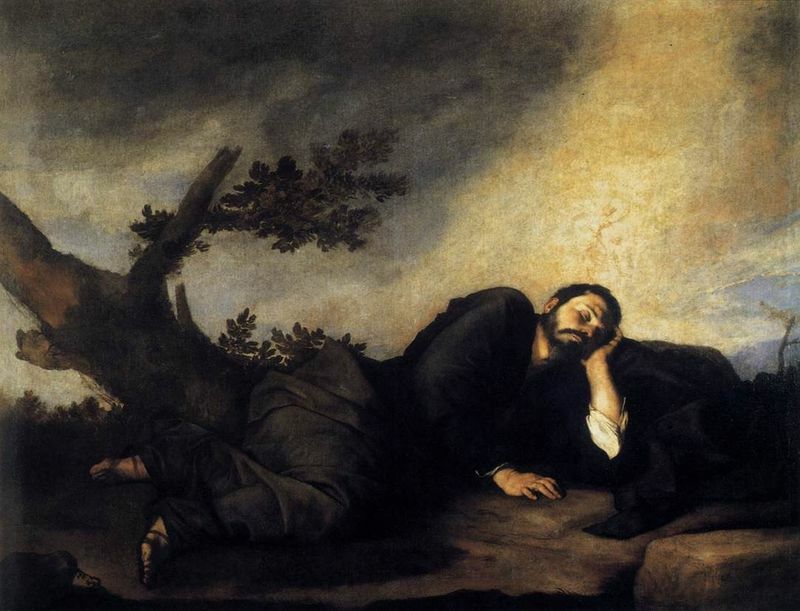 Ribera had a relapse of his illness in 1649, and as a result of his inability to work both due to his sickness and to the tumult of the rebellion, the Ribera family began to experience real financial trouble. The situation was worsened when Ribera had to take his daughter Margarita back into his household after her husband died only a few years after their wedding. Ribera's difficulties were such that in 1651, he wrote a petition to the King asking for some financial compensation for Margarita's widowhood. Ribera would never have the time to see if his petition would come to fruition, however. The next year, in July 1652, he moved into a smaller, quieter house in the Mergellina district and died shortly thereafter. Head of a Man Line and Finished Studies of Mouths and Noses Saint Albert Saint Jerome Hearing the Trumpet of the Last Judgment Seven Line Studies and Six Finished Studies of Eyes Silenus at the Wine Vat.